Miss your younger Etch A Sketch days? 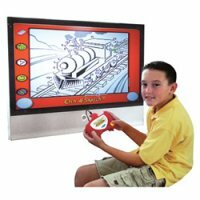 Relive the childhood fun of Etch-A-Sketch® by drawing on your television! Simply plug the controller into your TV and explore 4 activity modes: Cool Drawing Tools, Trace A Pic, Super Sketch and Connecting The Dots. The image you draw with the controller magically appears on the screen and you just shake the controller to make the image magically disappear from the screen! You can pick up this for an extremely early Christmas present for $12.98.